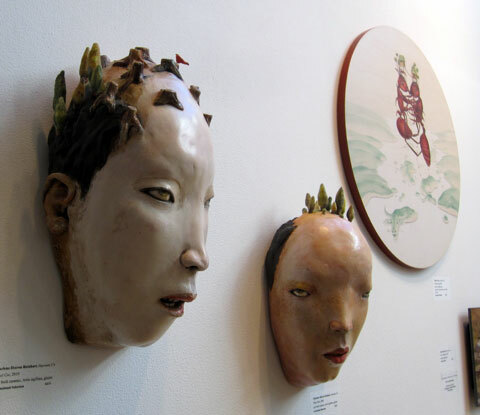 far right: Tiffany Bozic -"Traveling Light"
Thanks for the link, you're look great and I'll head on over to see more great art. What a wonderful exhibit - so diverse, but still keeping the Outlandish theme. Your pieces look wonderful as part of the exhibit. It is beautifully installed. Congratulations on the inclusion of your pieces!! I'm so glad to hear about it and I'm so proud of you!! Love your pieces in the photo! Hello Linda---Hope you have fun looking at all the different art. This show had a nice, eclectic mix without it being way out there. It had a nice flow and each piece threaded its way to the next. Hey there, Judy---The curator, Carrie Lederer, is well known for her thoughtful and beautifully installed exhibits. She's an extraordinary artist, too. Thank you, sapphire for your thoughtful compliments. You made my quiet day even sweeter.